Babiana fragrans (Iridaceae). It grows in granite, sandstone and sometimes clay slopes. 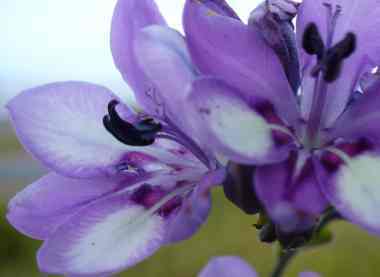 The flowers are pale violet with dark blue to purple markings near the base. The flowers are heavily fragrant. Sowing : Seeds are sown in autumn, in deep pots, seed trays or raised seed beds, in the same medium recommended for adult corms. The seeds should be sown thinly to prevent overcrowding and the development of damping-off fungi, and kept moist by regular watering using a watering can fitted with a fine rose cap. Seedlings should remain undisturbed for two years. Locality: Porterville. Harvest: November 2018.